It may help to know that very few students get through the college selection process without hurt feelings. And disappointment hurts. No one else has any idea! The most useful places to start your scholarship search are listed here. For those of you who were placed on the waitlist, here's a blog to answer all of the questions you may have. With March Madness upon us, and college acceptances arriving by e-mail and paper mail in the next few weeks, it is timely to ponder which schools are the best basketball schools for a true college basketball fan. What if you are not projected to score high on the SAT? Should you consider taking the ACT instead? Motivated high school students have difficult choices when planning their class schedules for the next academic year. Alumni are not only a school’s most important asset; they are also its most unique one. Are you planning any college tours in cold weather locales for November, early December or after the New Year? If you are its essential to be prepared, as often the weather might not be your best friend. College football dominance meaning that college football has the limelight during the season, resilience meaning that the team draws well, no matter their record. For a college town to be an effective hub for future entrepreneurs, it should not only offer academic opportunities; it should also be a place where adults, once they're no longer students, will never tire of living in. Budding Broadway actors don't need to go to school in NYC to "make it" on Broadway. There are programs all over the country that prepare you for a successful theater career. What if you want to go to college where one school has a vibrant college town all to itself? Whenever you hear the words “college town,” what comes to mind? Fun and interesting stores and restaurants, some that are household names? Sports bars and bookstores? Clothing stores that sell new and vintage fashions? Music stores and dance clubs? College towns are vibrant because they offer so many things for students, and parents, to do. The idea of a college town is often associated with a large university. It might even be the flagship state school. Or it might be an institution in a larger city with many colleges. But while college-bound high school seniors and their families may like the idea of going to school in a college town, not everybody wants to enroll at a large school. In that case, there are two possible options: choose a smaller school that shares a college town with a larger one, or go to a smaller school that has a college town all to itself. In this first of two posts, I’ll cover college towns where a small college with relatively achievable admissions, where more than half of the students who apply are accepted, shares the town with another, often larger institution. Daytripper University has already covered multiple schools in two such towns: Amherst, Massachusetts (home to Amherst College, Hampshire College, Mount Holyoke College, Smith College, and U-Mass-Amherst) and Ithaca, New York (home to Cornell University and Ithaca College). This post will introduce you to six more small schools, located in four other college towns. 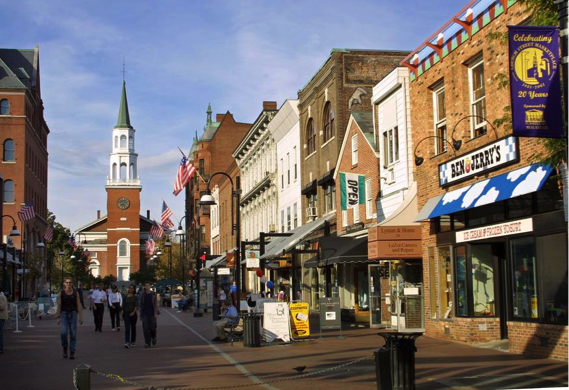 Burlington is not only home to the University of Vermont, but also to Champlain College. This 2,200 student school offers an “upside down” academic program that lets freshmen take as many as six courses in their major, and pursue internships as early as the summer after their first year. St. Michael’s College, a 2,000-student school in nearby Colchester, places more emphasis on the liberal arts. It is one of the only three Catholic colleges in New England—Boston College and Holy Cross are the other two—that has a chapter of Phi Beta Kappa, the most prestigious academic honor society in the United States. Affectionately called ‘St. Mike’s’ this school is a great bet for bright students who adore everything outdoors including hiking, sailing, skiing, snowboarding, as well as access to Burlington, one of the most popular college towns, as Daytripper’s correspondents' report. Home to Drew University, a 1,600-student liberal arts college, within walking distance of downtown, and Fairleigh Dickinson University, a 3,400-student school built on the grounds of a former estate, only a free shuttle ride away, Madison, New Jersey has a smaller, and more family oriented downtown than Burlington, but also something extra: easy access into New York City via New Jersey Transit trains. Drew takes advantage of its location to offer six New York Semester programs, exclusively for undergraduates. Fairleigh Dickinson’s campus is home to the International School of Hospitality and Tourism, one of the leading hospitality management schools in the country, and a partner with global hotel chain Wyndham Worldwide to offer classroom-based projects and internship opportunities. Located less than 20 miles from Baltimore’s Inner Harbor, Towson, Maryland, is home not only to Towson University, one of the state’s “growth institutions,” with more than 23,000 students, but also Goucher College, a 1,600 student liberal arts school, and one of The Colleges That Change Lives. The first college to require all students to have an educational experience abroad, Goucher’s bucolic campus is across from Towson Town Center, a luxury shopping mall with over 180 stores and many dining options, anchored by a four-story Nordstrom department store. Goucher is also a stop on the Baltimore Collegetown Network, a free bus service that connects the college to other area schools as well as the Inner Harbor. Kalamazoo, Michigan is host not only to Western Michigan University, a state school with 23,000 students, and four campuses in town, but it has also been home to Kalamazoo College, aka ‘K. College,’ another one of The Colleges That Change Lives, since 1833. This 1,500-student liberal arts college is noted for the ‘K. Plan’, that combines a liberal arts education, with a real-world learning experience, study aboard and a Senior Individualized Project, a graduate-level thesis, performance or creative work. While Kalamazoo, aka “K-town,” is over two hours from Chicago or Detroit, its downtown offers many of the same amenities students will find in a college town such as Bloomington, home to Indiana University or West Lafayette, home to Purdue, although the sports programs will be lower profile than they are in these Big Ten communities. 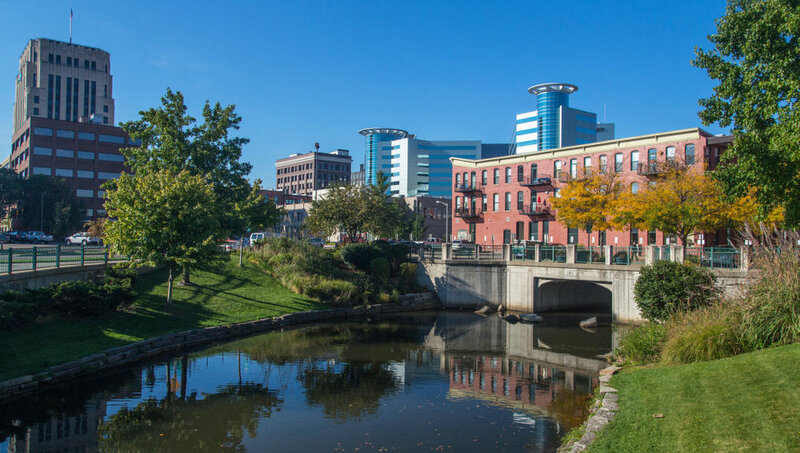 If you are looking for a college town, but don’t like large universities, these towns and schools have much to offer students: a great place to live, signature academic programs, as well as real-world learning opportunities. Even when students ultimately may travel away from campus for an internship or study abroad, they will still consider their college town their true educational home. Members of the class of 2022 are coming back from gap years studying cuisine in Paris, learning Spanish in Honduras while researching in the Mayan Highlands, while some will have spent time interning to save money for college or participating in public service projects. Read about their experiences and how a gap year made perfect sense for them.